1 D None No Power Seat 1 D is an Economy Class Exit Row with extra legroom. However, the close proximity to the lavatory and galley may be bothersome. This seat is designated by Allegiant as a "Legroom +" seat. Allegiant charges an additional fee to reserve this seat. The tray table is in the armrest, making the armrest immovable and slightly reducing seat width. There is no floor storage for this seat during take-off or landing. 1 E None No Power Seat 1 E is an Economy Class Exit Row with extra legroom. However, the close proximity to the lavatory and galley may be bothersome. This seat is designated by Allegiant as a "Legroom +" seat. Allegiant charges an additional fee to reserve this seat. The tray table is in the armrest, making the armrest immovable and slightly reducing seat width. There is no floor storage for this seat during take-off or landing. 1 F None No Power Seat 1 F is an Economy Class Exit Row with extra legroom. However, the close proximity to the lavatory and galley may be bothersome. This seat is designated by Allegiant as a "Legroom +" seat. Allegiant charges an additional fee to reserve this seat. The tray table is in the armrest, making the armrest immovable and slightly reducing seat width. There is no floor storage for this seat during take-off or landing. 14 A None No Power Seat 14 A is an Economy Class Exit Row with extra legroom. This seat is designated by Allegiant as a "Legroom +" seat. Allegiant charges an additional fee to reserve this seat. 14 B None No Power Seat 14 B is an Economy Class Exit Row with extra legroom. This seat is designated by Allegiant as a "Legroom +" seat. Allegiant charges an additional fee to reserve this seat. 14 C None No Power Seat 14 C is an Economy Class Exit Row with extra legroom. This seat is designated by Allegiant as a "Legroom +" seat. Allegiant charges an additional fee to reserve this seat. 14 D None No Power Seat 14 D is an Economy Class Exit Row with extra legroom. This seat is designated by Allegiant as a "Legroom +" seat. Allegiant charges an additional fee to reserve this seat. 14 E None No Power Seat 14 E is an Economy Class Exit Row with extra legroom. This seat is designated by Allegiant as a "Legroom +" seat. Allegiant charges an additional fee to reserve this seat. 14 F None No Power Seat 14 F is an Economy Class Exit Row with extra legroom. This seat is designated by Allegiant as a "Legroom +" seat. Allegiant charges an additional fee to reserve this seat. 2 A None No Power Seat 2 A is an Economy Class Exit Row with extra legroom. However, the close proximity to the lavatory and galley may be bothersome. This seat is designated by Allegiant as a "Legroom +" seat. Allegiant charges an additional fee to reserve this seat. The tray table is in the armrest, making the armrest immovable and slightly reducing seat width. There is no floor storage for this seat during take-off or landing. 2 B None No Power Seat 2 B is an Economy Class Exit Row with extra legroom. However, the close proximity to the lavatory and galley may be bothersome. This seat is designated by Allegiant as a "Legroom +" seat. Allegiant charges an additional fee to reserve this seat. The tray table is in the armrest, making the armrest immovable and slightly reducing seat width. There is no floor storage for this seat during take-off or landing. 2 C None No Power Seat 2 C is an Economy Class Exit Row with extra legroom. However, the close proximity to the lavatory and galley may be bothersome. This seat is designated by Allegiant as a "Legroom +" seat. Allegiant charges an additional fee to reserve this seat. The tray table is in the armrest, making the armrest immovable and slightly reducing seat width. There is no floor storage for this seat during take-off or landing. 31 A None No Power Seat 31 A is a standard Economy Class seat in the last row of the aircraft. The proximity to the lavatories and galley may be bothersome. 31 B None No Power Seat 31 B is a standard Economy Class seat in the last row of the aircraft. The proximity to the lavatories and galley may be bothersome. 31 C None No Power Seat 31 C is a standard Economy Class seat in the last row of the aircraft. The proximity to the lavatories and galley may be bothersome. 31 D None No Power Seat 31 D is a standard Economy Class seat in the last row of the aircraft. The proximity to the lavatories and galley may be bothersome. 31 E None No Power Seat 31 E is a standard Economy Class seat in the last row of the aircraft. The proximity to the lavatories and galley may be bothersome. 31 F None No Power Seat 31 F is a standard Economy Class seat in the last row of the aircraft. The proximity to the lavatories and galley may be bothersome. Allegiant flies this aircraft in a one class configuration with 177 standard Economy seats. None of the seats on this aircraft recline. I was AMAZED at how bad their seats are! Hard plastic shells, with little padding; they do not recline; the seat tray is 5" by 12" and has trouble holding a drink and a can of soda...and doesn't lift up into the seat back, but hangs out an inch or two. Tight leg space and no room in the pouch for a water bottle. This was a new plane. Window-side armrest raises, providing a little extra room on that side. One issues, the interior wall of the cabin is "scalloped", meaning there are curves every other row (even rows) that stick into the cabin, reducing the width of your window-side space by 1-2 inches. For a window seat, best to pick an odd row for a little extra room. Rows 2-11 Seats A, B,& C on my flight, PIE-MKE, are Legroom+. 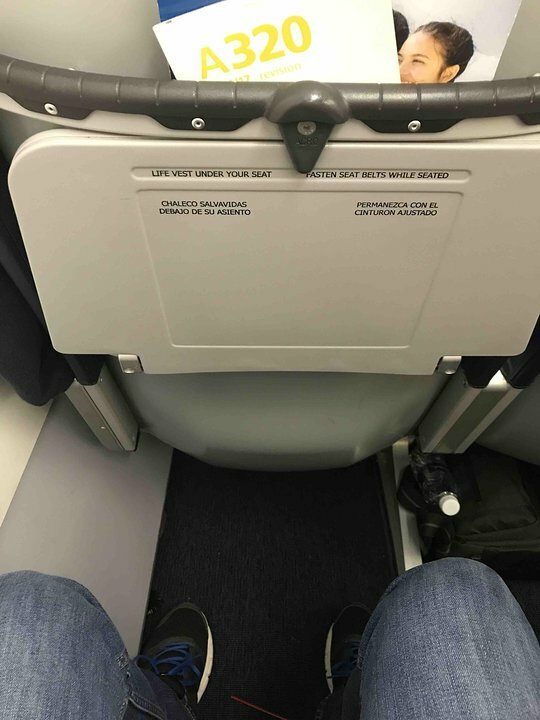 Legroom is good; I am 6'1", 200 lbs. Seats are firm, but reasonably comfortable. This seat was assigned when I didn't pay extra to select a seat. It's not worth paying upcharges (they try and get you again when you "sign in" 24 hours before. Don't change your seat. The good news: This is first row, so you have lots of leg room. The bad news: This seat is very narrow. There is no undersea storage and ALL belongings have to be stowed overhead, even your purse! All Allegiant seats are hard and uncomfortable. This seat does not recline at all. The tray table is in the armrest. This is the first row, so there are constant people in front of you, while waiting on the bathroom right in front of you, getting on and off the plane, and the flight attendants who sit in flip down seats during take off and landing and whose knees nearly touch yours during those times, also the flight attendants are near you in galley talking throughout entire flight. Also, the engine noise is louder on all Allegiant planes than any other airline I've ever flown. Take your headphones and turn them up. This seat is: In front row. By a window. Has more leg room. Is very narrow. Has a partial wall separating you from flight attendants who talk loudly, constantly and making noise in galley, which is immediately behind the wall. This seat has a loud engine noise. All Allegiant planes I've flown are very noisy compared to other airlines though. I flew Columbus to Fort Lauderdale which is a 2 and a half hour flight. I upgraded to Legroom+ for only $10, and it was worth it. I had plenty of legroom for the entire flight and even though the seat wasnt the most comfortable, but was okay for 2 and a half hours. The crew was nice and friendly, and overall a great flight. Very narrow space/foot room between row 15 and exit row 14. Exit seats are set back farther making row 15 seats very uncomfortable,confining, almost claustiphobic. Seats 3A, B, and C all have amazing legroom. Row 2 is actually further up than the diagram here, creating plenty of space for row 3. I am 6'1" and I could stretch my legs all the way out, making this one of the most comfortable 2 hour flights I have been on. The seats however are hard and pretty narrow because of wide aisles, but it is a low cost carrier. However, sit in row 3 on ABC side and you won't even notice. 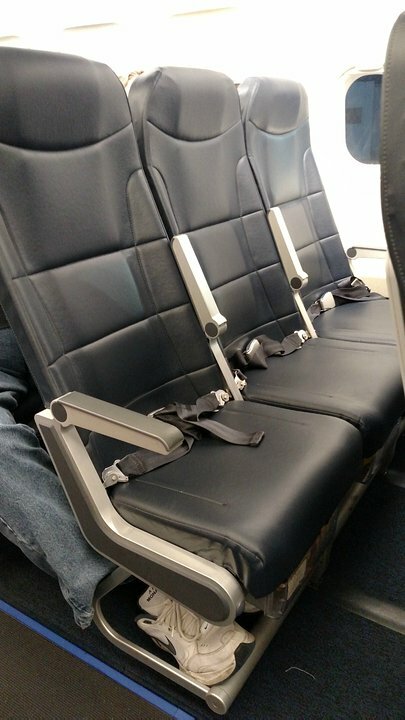 Allegiant went out of their way to make these seats uncomfertable. There is no pading on the seat, a subway car probably offers more comfort. Spend the money and book another airline! Seat does not recline and is hard, but was ok for the 2 1/2,hour flight. Tray tables are in the seat back in front of you and there is room under the seat in front of you to store personal carry-on. My knees were several inches from the seat in front of me which made up for the uncomfortable seat. Seat was very narrow, seat cushion was very hard, seat back is too upright. Do your buns a favor bring a cushion or small pillow! Flew on Allegiant Airbus A320 equipped with brand new seats. This was the most uncomfortable seat I have ever flown. Hard padding, narrow width and not more than an inch between my knees and the seat in front. Allegiant got these from Iberia, increased capacity to 177 from 162. Allegiant flies 1 versions of Airbus A320.